Microsoft is preparing to release the next version of Windows, code-named "Threshold," in a public preview this fall, according to a Friday report. ZDNet's Mary Jo Foley reports "Threshold" will be released in either late September or early October, well in advance of the speculated official release date late in 2015. Microsoft officials did not immediately respond to requests for comment. Microsoft has referred to the next version of Windows only obliquely, presumably trying to focus consumer attention on the current version, Windows 8.1, and its latest update. In conversation, however, Microsoft representatives have begun using the Threshold name. As one might expect, Threshold should include a boatload of new features that will resonate with consumers: a revamped Start menu, support for virtual machines, and a new way of booting up. 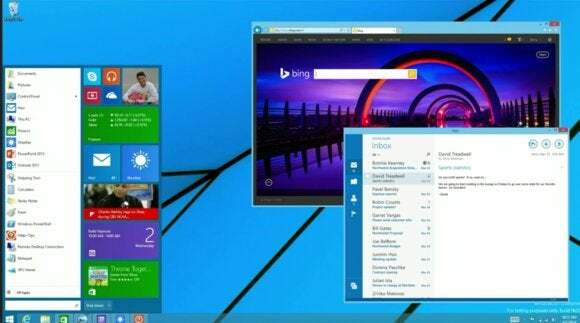 On tablets, the machine will boot to a tiled Start Page interface, while the traditional desktop view will be shown on notebooks and desktops. Microsoft has also made Threshold the focus by paring down its Windows 8 releases into a steady drip of relatively minor updates delivered monthly alongside its security updates. (Its August update, for example, delivered improvements to Windows touchpads and added support for turning the PC into a Miracast receiver.) That has made Threshold the next big thing in the Windows world. A September technical preview also roughly aligns with the release of the next generation of hardware. At the IFA show in early September, Intel is expected to formally announce the first "Broadwell" processors based on the 14nm technology it recently unveiled. Several hardware OEMs are scheduled to release either new products based on the chips, which will be known as the "Core M" for notebooks, or hardware refreshes that replace existing Core processors with the new Intel chips. If that's the case, a combination of Threshold and Broadwell could inject a jolt of adrenaline into a PC market badly in need of it and offer consumers and businesses alike a reason to open their checkbooks.